A few issues back, in Vol.9 No.3, I used "As We See It" to clarify what Stereophile writers have in mind when they use the term "transparency" in equipment reports. This time, I'll do the same thing for the performance parameters of bass reproduction. It has become accepted lore in audiophile circles that the 44.1kHz sampling rate adopted for Compact Disc is too low. 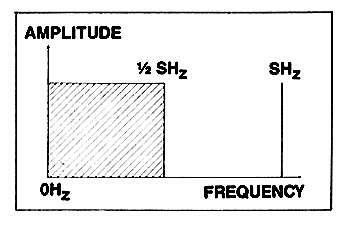 Some writers have argued that, as a 20kHz sinewave will only be sampled about twice per cycle, it will not be reconstructed accurately, if at all. The title of this month's column is the legend Sheffield Labs emblazoned on a T-shirt a couple of years ago, to promote their jaundiced view of digital audio. Since then, even Sheffield's reactionary perfectionists softpedalled their anti-digital crusade, perhaps because of the number of CDs they've been selling! Their personnel no longer wear those T-shirts at CES, which is unfortunate. Although most people in the audio field no longer see digital audio as madness, digital denouncing is still very much with us. Almost 30 years ago, Columbia records issued a unique disc called The Art of Jonathan and Darlene Edwards. Darlene sang and Jonathan played piano, and the jacket notes rhapsodized about the depth of feeling they brought to their duos, despite some imperfections of technique. A tradition is anything we do, think, or believe for no better reason than that we have always done it, thought it, or believed it. Most traditions are followed in this mindless and automatic way, and, if questioned, are defended with the argument of, well, that it seems to work. It's time-tested, true-blue and, because so familiar, as comfy as an old slipper. So why rock the boat, throw a wrench in the works, or fix it if it ain't broke.